As everyone says… Happy Saturday! (I wanna figure out a different greeting… “Swonderful Saturday”? Uhhhh…) Anyways, hope y’all are having a wonderful day and looking forward to a great Sunday, too! Living in a small home always has it’s fun challenges. And the kitchen is no exception. 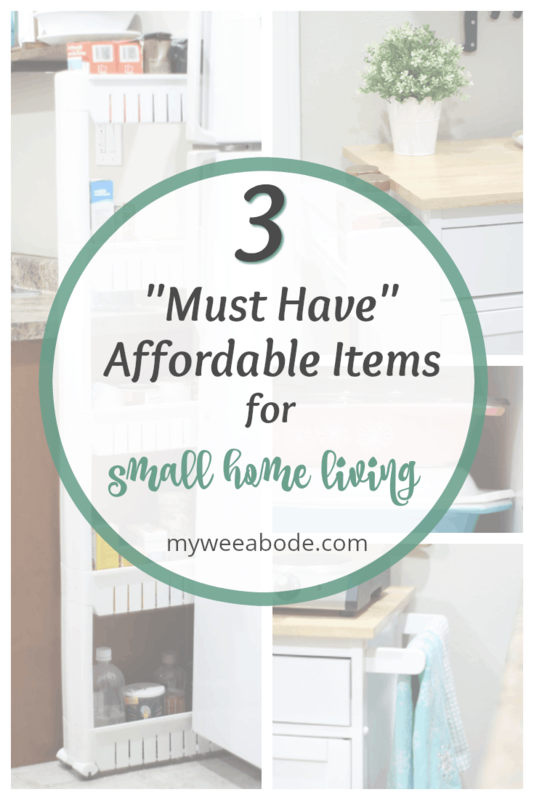 Since moving into MWA, I’ve collected a few ‘must haves’ that I think are important for any tiny house, especially a loft or studio apartment. 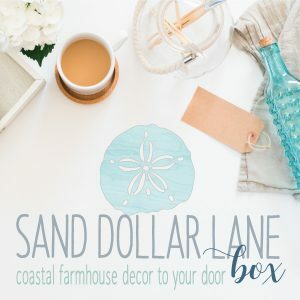 But, if you have a large home, or even own your home, you may find these items pretty helpful for you, too! So, let’s take a look! One of the things I really love, and use ALL THE TIME, is my portable island. I did lots of research on this ‘must have’ before I purchased it because I needed something narrow, something moveable (portable), something utilitarian, and, of course, something pretty! This island ticked all the boxes. It was shallow enough to fit the space I had (bet you didn’t realize that my kitchen is entered into by my front door!) The island is also on wheels, which makes it wonderful when I want to move the island to the middle of my little kitchen and use it as a dining table. I love that it has two drawers (I keep my silverware in one and potholders and dishcloths in the other). It has two cupboards, a spice rack, and towel rack! Very utilitarian! 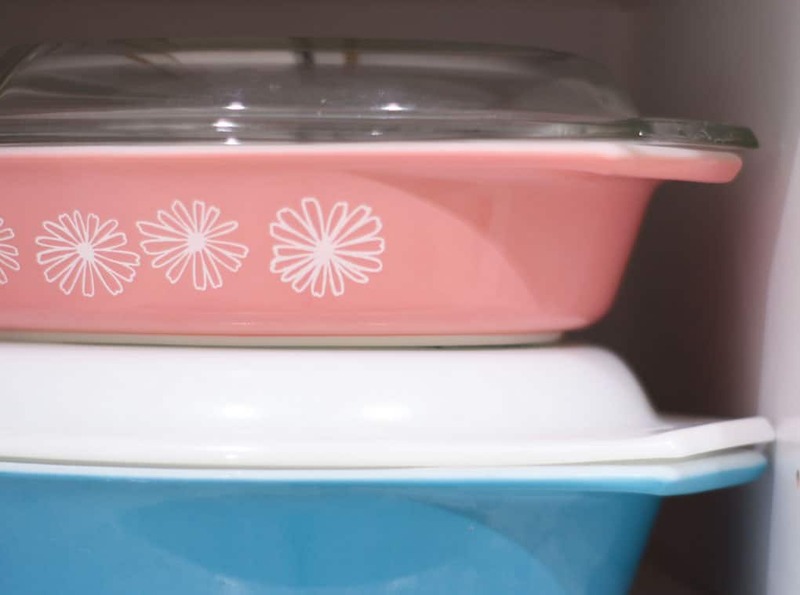 As far as being pretty, being white was a ‘must’, and I love the fact that it has open space for storing my pretty vintage Pyrex. 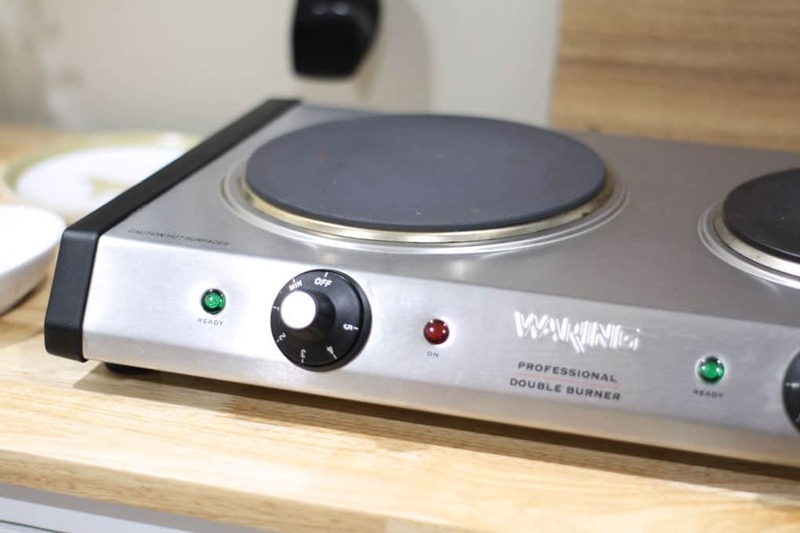 My second must have is my Waring Commercial WDB600 Heavy-Duty Commercial Cast-Iron Double Burner. What I haven’t shared before is that My Wee Abode has everything a normal kitchen has, except a stove/oven! (In CA, a home that is 400sf or less cannot, legally, have a built-in stove/oven.) 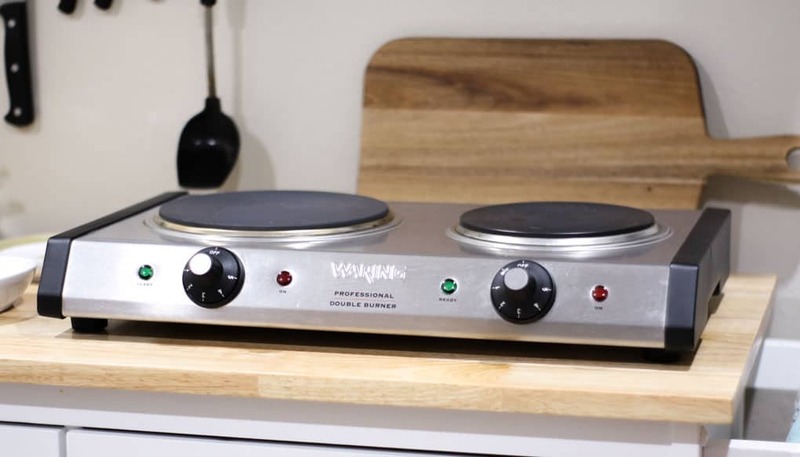 So, I researched lots of burners and found this particular one to have great reviews because it is heavy-duty, commercial grade and cleans up great! My last item (for today) is my Slim Slide-Out 5-Tier Storage Tower. Because of the limited cupboard space in My Wee Abode’s kitchen, I really have to use every inch of space for storage, without looking cluttered! 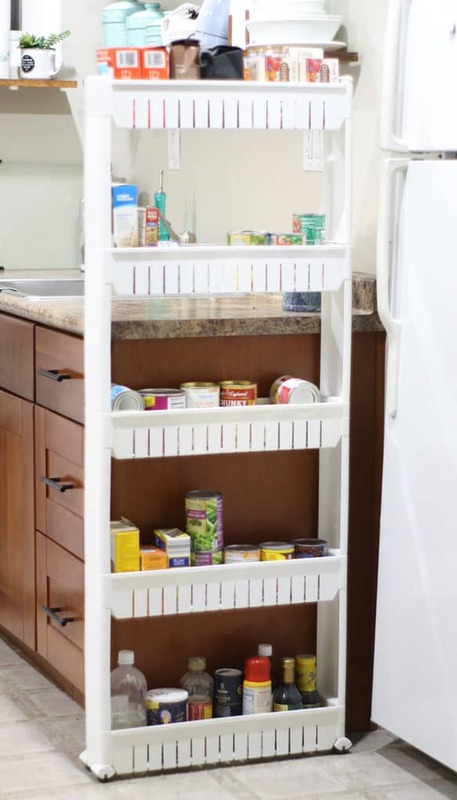 If you have 5-6 inches of horizontal space in your kitchen, this storage tower, which I call my hide-away-pantry, will slide right in! 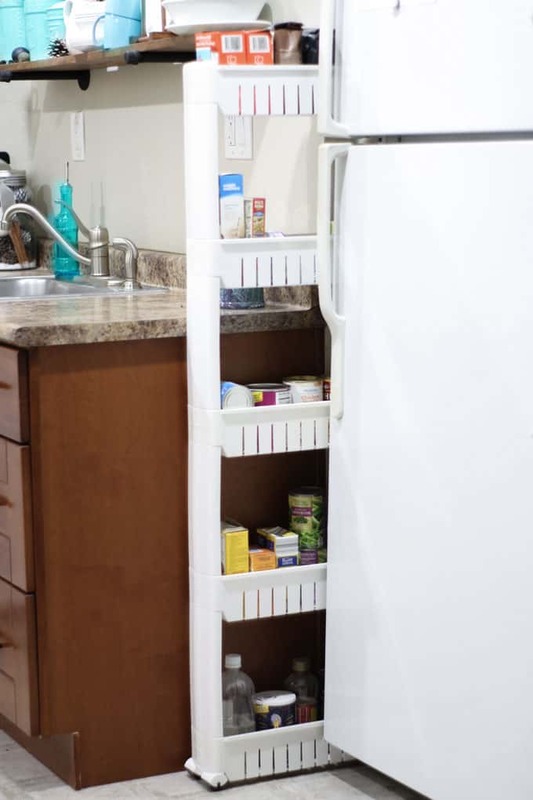 As you can see, I use this to store my canned goods, and other pantry-type items. So there you have it! 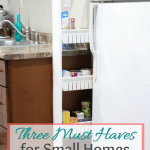 These are just three of my ‘must-haves’ for living in small home! More products to come in future posts! 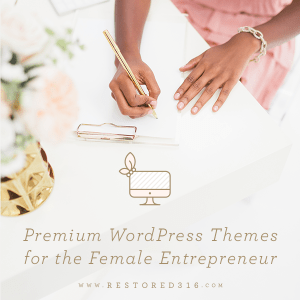 Let me know in the comments if you have any questions. 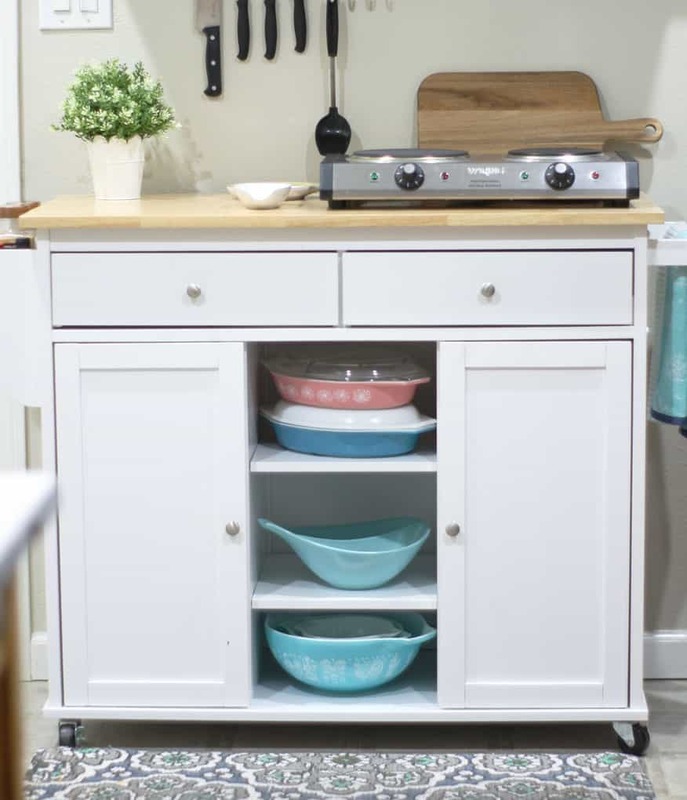 Do you have any products that are great space-savers, storage solutions, or otherwise helpful in a small, or large, home? 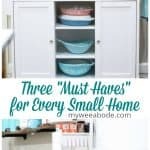 What items are the most important for you in a small home, or any size home? I would *love* to hear about them in the comments! That’s a really great tip about sheets! I have only two sets of sheets… I need to have the extra set, as I don’t have laundry facilities available at my fingertips. 😉 Thanks for sharing… and commenting, Darlene! I really like that tower Julie. My kitchen is so small there is no room for anything at all. Thanks, Mary! The tower is SO helpful! I TOTALLY understand needing to use every inch in the kitchen! I’ll have a post about my whole kitchen, soon! Thanks for coming by! 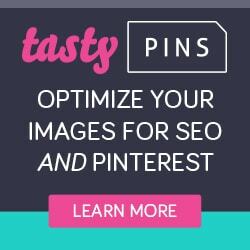 I love to organize my home every second so these are great tips. Hi, Maria! Glad these tips offer you some help! It’s always a challenge to use my space effectively, but still make it pretty! Thanks for coming by! Hugs! 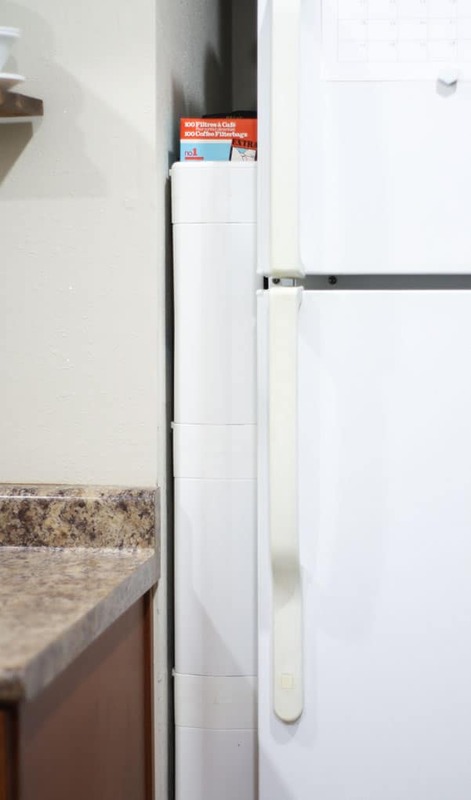 In one apartment that I lived in, I had a large kitchen but it only had one small cabinet/counter top between the sink and range. I too used a rolling cart for extra storage and counter space. Mine was functional, but not as pretty as yours. 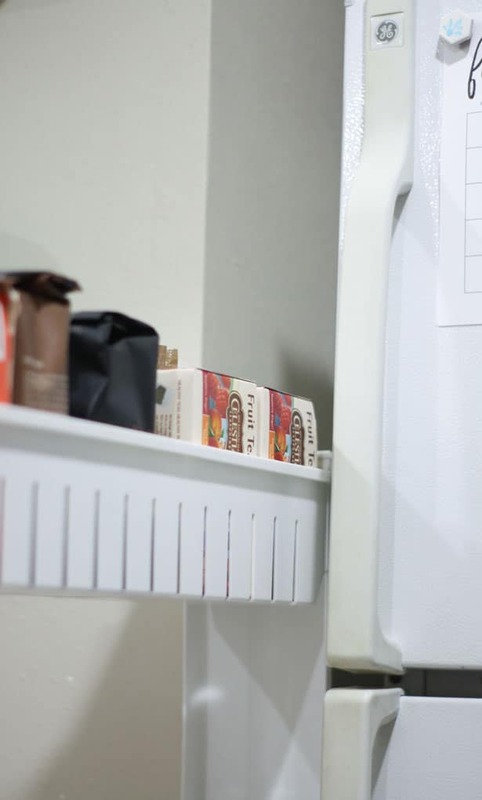 Another thing I did, was to put a small bookcase on top of the refrigerator. (It had not cabinet over it!) I kept my cookbooks on it. It actually looked built in. Worked great! Oooo, a book shelf on the top of the fridge! That’s a GREAT small home solution! LOVE IT! 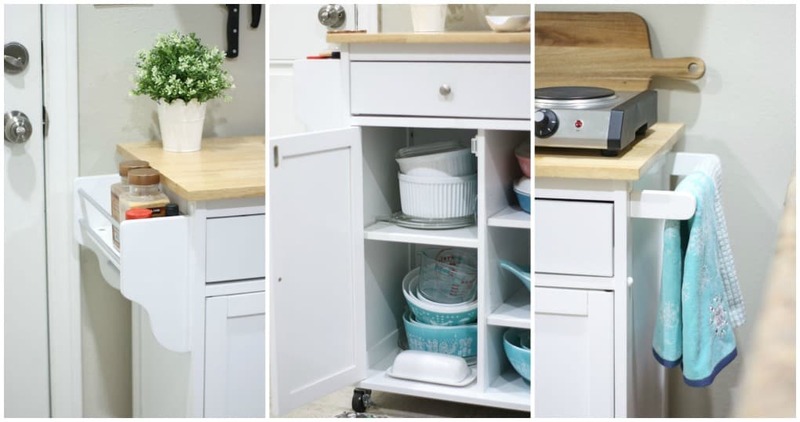 I’ll soon be sharing a couple more small aspects of my wee kitchen… I’m hoping it will be helpful! Thanks for dropping in, Nancy! Hugs & hearts!